Since its inception in late 2011, as the application of “parachute cord” gained meteoric rise, Paracord Planet has been devoted to supplying "do-it-yourselfers" with the absolute highest quality of paracord. With a keen eye on market trends, and open ear towards customer requests, we have been able to sustain an unwavering advantage amongst stiff competition in the survival gear industry. What truly sets Paracord Planet ahead is its unique location. Located in Fargo, North Dakota, our workers are exposed to intense climate conditions that call for our ever functional paracord to be used. Every product in our warehouse has been hand-tested by our employees so that our customers can rest assured that they are purchasing a product of the utmost quality. Driven by our enduring desire to meet and exceed our customers’ needs, we are committed to continually developing creative business approaches. 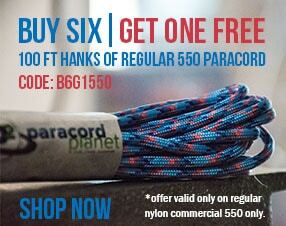 Why did we make Paracord Planet? Paracord Planet was created following the surge in demand for survival bracelets and other paracord products. We envisioned a website in which every unique customer’s needs could be met by providing as many product options as possible. Our seemingly endless collection of various paracord styles, colors, and accessories is guaranteed to suit the diverse tastes of our entire customer base. We want to inspire creativity in our customers. By hosting a website filled with a plethora of different paracord products, creativity is allowed to prosper. Like all thriving companies, nothing drives us more than the desire to stay ahead of our competition. We’ve seen what other survival gear companies are doing, and we genuinely feel like we can do it better. Our perpetually high standards equate to relentless customer service. We refuse to ship something to a customer that is less than satisfactory. Both complaints and compliments are of the utmost importance to us, and are dealt with accordingly. Aside from exceeding our competition, and satisfying our customers, we are also inspired by the goal of expanding our brand name. We love seeing Paracord Planet being talked about on social media sites. From Facebook posts to tweets, we genuinely appreciate everything that our loyal fans do to spread our products. Finally, we are driven by giving back. We are tasked with the objective of acting socially responsible, and creating jobs right here in America. All of these visions for our company have helped to brand Paracord Planet as a leader in the survival gear industry. Who makes the products at Paracord Planet? 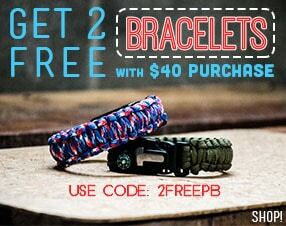 All paracord bracelets sold on Paracord Planet are designed, created, and manufactured right here in Fargo, ND, USA. We have a design and manufacturing team that has been as large as twenty people in the past and we only see that number increasing with the birth of Paracord Planet. Our manufacturing team isn't hidden away in some dark and dingy warehouse. They are located right alongside our marketing team in our office and often times you'll see them bringing new creations over to the marketing department to get onto our site. How do I contact Paracord Planet? To reach out to us through social media, please like us on Facebook, follow us on Twitter, and add us to your Google+ circle (this is also a great way to stay up-to-date with all things Paracord Planet).